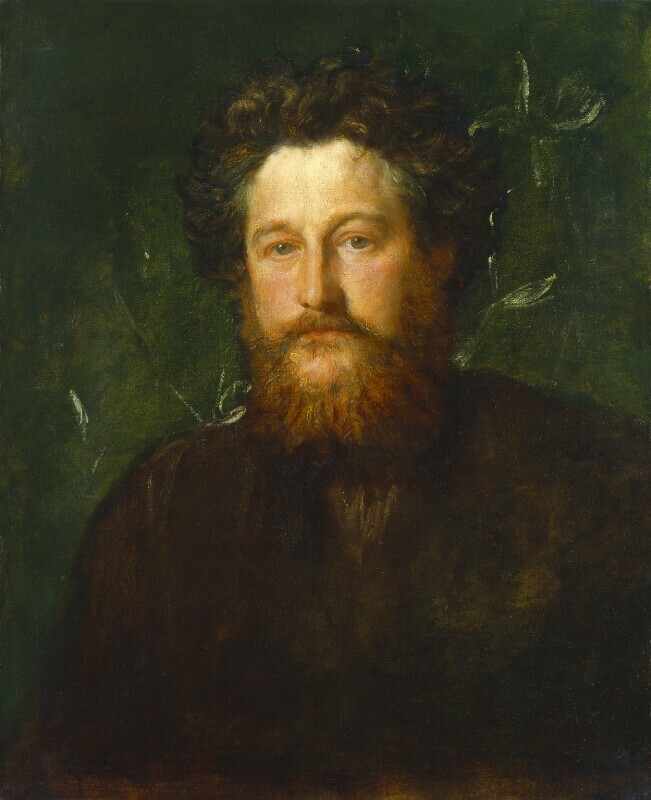 William Morris sat to George Frederic Watts in April 1870, a few months after Edward Burne-Jones: theirs were further heads to add to Watts’s growing collection of eminent Victorians, his ‘Hall of Fame’. Morris’s phenomenal busyness, his impatience and apparent dislike of sitting add further value to Watts’s portrait. Not only is it the prime portrait in oils in Morris’s small painted iconography: it owes its existence to Watts’s perseverance, his ambition to realize a pantheon of great Victorians. And it owes its iconic status to Watts’s determination to present selections of his portrait heads to the nation – here the National Portrait Gallery – for the fullest public display. There are over fifty portraits by Watts at the NPG. The first wave consisted of a gift of seventeen pictures presented in December 1895; the spur was Ewan Christian’s new building in St Martin’s Place, which opened to the public in April 1896. The present portrait was officially presented in 1897, although it had been earmarked earlier, in September 1895: Gallery rules precluded displaying it during the sitter’s lifetime, and it had remained with the artist. However, when the time came – Morris having died on 3 October 1896 – Watts evidently wished to hold on to the painting for longer: ‘Of course the portrait of William Morris is the property of the Gallery & if claimed now shall be sent to you, but I should much like to have it for a short time to form part of an exhibition of my works in the Winter exhibition to have place in the New Gallery, please let me know if this can be.’ In the course of the exhibition the director of the New Gallery, L.C. Lindsay, wrote, ‘of course if the Portrait of William Morris must be submitted to your Board on the 25th [February 1897] I shall be happy to allow you take it for the meeting. As it naturally at present is one which is giving great interest I should like it to be away for as short a time as possible.’  In fact the portrait had been widely exhibited from 1880 onwards; it was and remains one of Watts’s best-loved portraits. As with the other Watts gifts and bequests, NPG 1078 arrived in its Watts-style frame of gilded oak. In 1896 the artist gave ‘exclusive photographic right’ over his pictures to Frederick Hollyer, and the portrait was much reproduced; it formed the basis of many of the obituary illustrations. There is a copy of the painting by Henry Holiday in the collection of the Society for the Protection of Ancient Buildings, London, and further copies at Castle Howard, Yorkshire and Marlborough College (copy or replica). As listed in the Register of applications to copy portraits, NPG 77/5, two artists applied to copy NPG 1078 in the period 1896–1954: K.M. Bishop, working between 11 September and 4 November 1920; and Kenneth Robinson, working between 28 October 1949 and 9 May 1950. For the mezzotint by Malcolm Osborne (and his interpretation of the background) see ‘All known portraits, By other artists, Posthumous portraits, exh. 1913’. 1) In fact 1870 is an important year for portraits of Morris (see ‘All known portraits’). For Morris’s attitude to portraiture generally and to the Watts portrait, see MacCarthy 1994, pp.269–70 (repr. pl.VI); and Gould 2004, pp.98–9. 2) Letter from W. Morris to Jane Morris [15 Apr. 1870]; Kelvin 1984, pp.115–16. 3) M.S. Watts, MS 'Catalogue of the works of G.F. Watts', compiled c.1904–38, 2 vols, Watts G. Archive, Compton, vol.ii, p.112, typescript copy NPG. According to Wilfrid Blunt (1975, p.96), Morris and Watts later quarrelled. 4) Letter from G.F. Watts to C.H. Rickards [no date]; Watts 1912, vol.1, p.255. 5) Reviewed The Athenaeum, 8 May 1880, p.605. 6) See NPG Report of Trustees 1897. M.H. Spielmann also gave the 1880 date, in a letter to L. Cust, 7 Nov. 1904, NPG RP 1000. 7) Letter from G.F. Watts to L. Cust, 22 Nov. 1896. The ownership of the portrait remained ambiguous, as in the spring it was sent from the New Gallery to a further show, the Fine Art Exhibition at the Whitechapel, to the indignation of the NPG Trustees. See correspondence in NPG RP 1078. 8) The frame was cleaned by F. Draper, May 1897; NPG RP 1078. 9) Letter from G.F. Watts to L. Cust, 1 Apr. 1896, NPG RP 1000. Examples include Mackail 1899, vol.1, photogravure frontispiece (loose copy, BM, London); a wood-engraving by ‘OWB’ after Hollyer repr. Graphic, 10 Oct. 1896, p.463; ILN, 10 Oct. 1896, p.456; and Black & White, 10 Oct. 1896, p.456. 10) G.K. Chesterton, Bookman, Dec. 1900, p.82 (ill.); see also Chesterton 1904, pp.66–9. Nearly half-length, slightly to left, full-face, with green eyes, russet moustache and beard, wearing brown jacket, set against greenish background decorated with sketchy plant forms. The artist; presented by him February 1897. Summer Exhibition, Grosvenor Gallery, London, 1880 (44). Winter Exhibition: Collection of the Works of G.F. Watts RA, Grosvenor Gallery, London, 1881–2 (94). Loan Collection of Pictures, Corporation of London Art Gallery, Guildhall, London, 1890 (78). Royal Society of British Artists Exhibition, London, 1892 (5). Winter Exhibition: The Works of G.F. Watts RA, New Gallery, London, 1896–7 (no further details). Fine Art exhibition, Whitechapel Art Gallery, London, 1897 (no further details). William Morris Centenary, V&A, London, 1934 (330). Le Livre Anglais, British Council for Bibliothèque nationale, Paris, 1951 (514). British Painting 1700–1960, British Council for Pushkin Museum, Moscow, and Hermitage Museum, Leningrad, 1960 (78). G.F. Watts: The Hall of Fame, NPG, London, and Laing Art Gallery, Newcastle upon Tyne, 1975 (45). William Morris Today, ICA, London, 1984 (no number). Treasures from the National Portrait Gallery, five venues in Japan, 1995–6 (29). The Wilde Years, Barbican Art Gallery, London, 2000–2001 (186). According to M.S. Watts, MS 'Catalogue of the works of G.F. Watts', compiled c.>1910, 2 vols, Watts G. Archive, Compton, vol.2, p.112, the portrait was also exhibited in New York, 1885; Birmingham, 1885–6; Nottingham, 1886; Manchester and Southwark, London, 1894; and Chester, 1895. Graphic, 10 October 1896, p.463 (as wood-engraving by ‘OWB’). Mackail 1899, vol.1, frontispiece (as photogravure by Walker & Boutall). Mezzotint by Malcolm Osborne, exh. RA 1913.